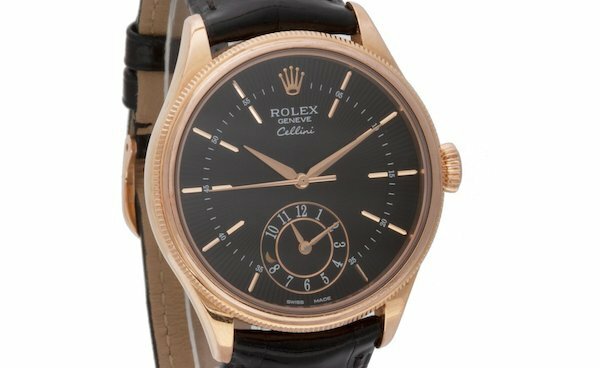 While the Cellini collection has been a part of Rolex’s catalog for decades, it was in 2014 that the brand introduced a new crop of modern Cellini dress watches flaunting a brand new design and an assortment of functions to choose from. Today, we’ll be reviewing a particularly handsome model—the Rolex Cellini Dual Time. With iconic models like the Submariner, Day-Date, GMT-Master, and Datejust, the Oyster Perpetual range is by far Rolex’s more popular lineup. Although there is a particular watch called the Oyster Perpetual, when we refer to Oyster Perpetual in this context, we are referring to a category of Rolex watches that come equipped with an Oyster case (with a minimum water rating depth of 100 meters) and a self-winding perpetual movement. The Cellini watches, on the other hand, sit outside the Oyster Perpetual range with precious metal cases that are water resistant to 50 meters. 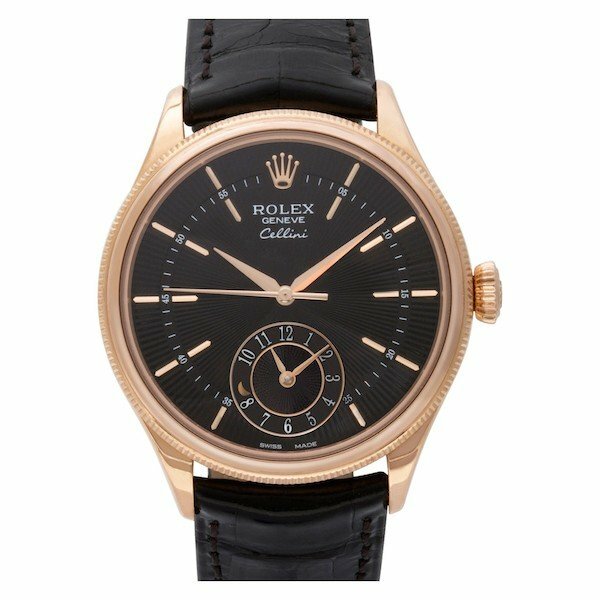 Rolex Cellini watches are also dressier than their Oyster Perpetual siblings, featuring many classic design elements typically found on traditional timepieces such as round decorated cases, guilloché dials, and leather straps. These are dress watches through and through. The Rolex Cellini Dual Time Ref. 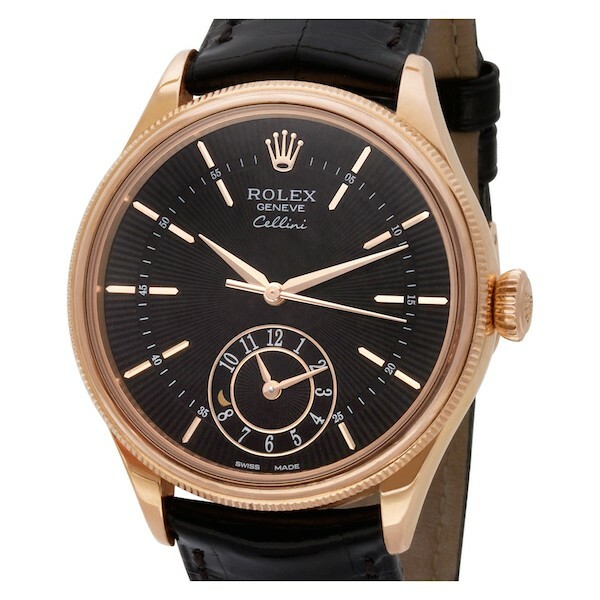 50525 dons an Everose gold (Rolex’s patented rose gold alloy) round case measuring an elegant 39 mm. The double bezel, with both a domed part and a fluted part, adds a decorative touch to the case. Plus, the flared screw-down winding complements the case fluted perfectly. Housed within the Everose gold case is a black guilloché dial in a striking sunbeam effect. The lines radiate from the center to the periphery of the dial and sets the background for the Everose gold dial details. There are the rose gold applied hour markers divided by an inner chapter ring, along with the rose gold faceted sword-shaped hands and rose gold crown. 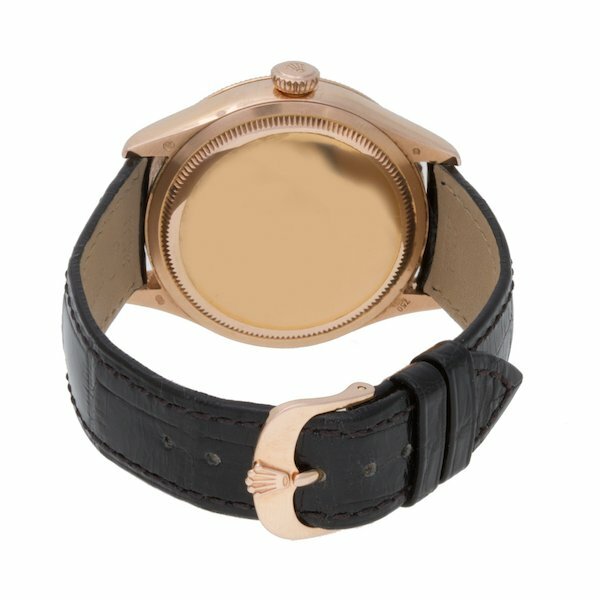 As its name suggests, the Cellini Dual Time indicates two time zones. In addition to the trio of center hands for local time, the Rolex 50525 includes a subdial at 6 o’clock to display another time zone on a 12-hour scale. There’s even an AM/PM indicator illustrated by a sun and moon nestled in the subdial to signify whether it’s day or night in that second time zone. Protecting the dial is a scratch-resistant domed sapphire crystal. In keeping with the Cellini Dual Time’s elegant appearance, this Rolex watch is fitted with a black alligator strap. To secure the watch over your wrist, Rolex furnished the strap with an Everose gold tank buckle, complete with the famous Rolex coronet. While many past Rolex Cellini models used manual-wound movements or quartz movements, the modern post-2014 Cellini watches run on automatic movements. For instance, powering the Rolex Cellini Dual Time Ref. 50525 is the Rolex Caliber 3180 self-winding movement. Like all modern Rolex movements, the Cal. 3180 is a COSC-certified chronometer movement. It operates at 28,800 beats per hour and provides a 48-hour power reserve. For a Rolex watch that’s decidedly dressier than the Oyster Perpetual options, take another look at the modern Cellini timepieces. While they may be underappreciated, they certainly deserve your attention. Rolex GMT Master 16710: The Last Classic Model Of Its Kind At Gray & Sons, we’re all about bringing some serious watches to the table.